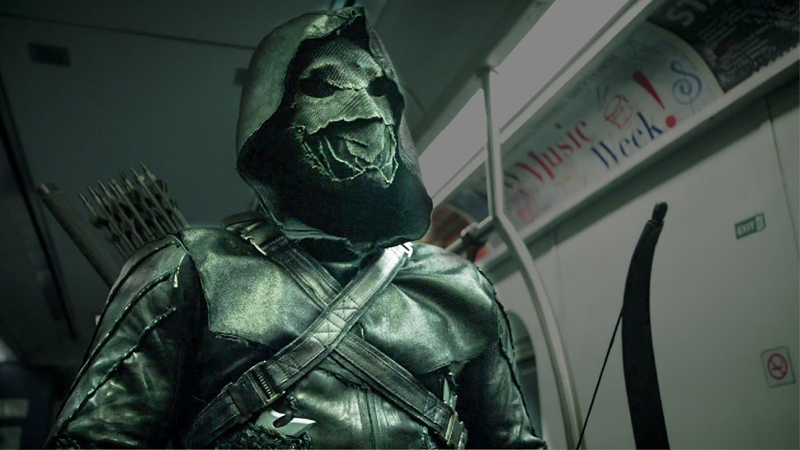 The last season of Arrow centered around the mysterious arrival of Prometheus, a masked bowman seeking vengeance against everything Oliver Queen has been working toward since becoming the Green Arrow. But even though he perished at the end of the season, Promethus will rise again in the CW/DC crossover event. Although we first glimpsed a masked archer on Phil Jiminez’s glorious poster for Crisis on Earth-X when it was revealed last week, Entertainment Weekly has now confirmed that the figure, who will join Nazi versions of Green Arrow (Dark Arrow), Flash (Dark Flash), and Supergirl (Overgirl) from Earth-X as the crossover’s villains, is definitely Prometheus... but not as we know him. On Arrow, Prometheus’ true identity was actually Star City District Attorney Adrian Chase, played by Josh Segarra. But Segarra won’t be returning for Crisis on Earth-X, meaning someone new will be under Prometheus-X’s mask. Given that the three other villains are evil mirrors of our beloved heroes, it stands to reason a familiar face could be used for Prometheus-X. Could it be one of the many identities offered up as a potential Prometheus in Arrow season 5, like Quentin Lance or Malcolm Merlyn? Or will it be someone entirely new? We’ll have to wait for the crossover to find out—Crisis on Earth-X begins in Arrow and Supergirl on Monday November 27.